This is a darling moose in a wonderful winter landscape. In the spirit of Christmas, he is wearing his jingle bells and has stopped to warm himself by the fire. Sure to "light up" your life! 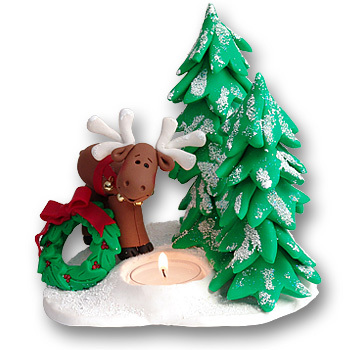 This Tea Light /Candle is hand made from polymer clay and includes one candle. Lovingly designed by Debi Allison.